Dallas/Fort Worth, TX—Is there sustaining comfort to be found for the suffering, perhaps flailing, faithful? 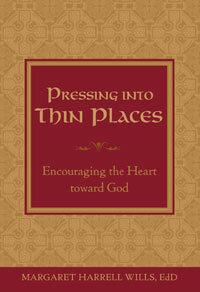 Dr. Margaret Wills, Ed.D, asserts that there is, and in her book, Pressing into Thin Places: Encouraging the Heart toward God (Brown Christian Press), she invites questioning, thinking, and hurting readers to recognize glimpses of wonder and to draw strength and find rest in the presence of a loving God. Dr. Wills knows from her own experiences that life is not simple and that we all need encouraging words and reasons to hang on to hope. She offers these in abundance in this deeply personal, beautiful, and thoughtful work that summons authenticity and contemplation while soothing the dark night of the soul with kindness and truth. With transparency and refreshing gentleness, Wills tackles universal fears, disappointments, wounded relationships, and even death and beckons readers to pull aside the veil and to see into that "thin space," as the Celtics called it, where all that separates heaven and earth becomes almost transparent. She invites readers to wrestle and be comforted by assurances of God's love and goodness even in the darkness. Pressing into Thin Places is a collection of stories from the author's personal experiences, punctuated by her poetry and infused with biblical verses and rich truths. Wills answers questions like, "How do we keep from falling into despair when pain and suffering weigh heavily upon us?" and answers honestly questions about doubt, mystery, and the experience of not knowing. Wills offers insight for bringing biblical truth to life, wisdom to cultivate a listening heart, encouragement for the downhearted, reassuring words for the faltering, and comfort and rest for those in any stage of their faith journey. A portion of the proceeds from the sales of Pressing into Thin Places will go to the John Brown University Center for Relationship Enrichment.